Often flute students are a little confused about composer's dates and musical styles, especially when asked to prepare "two contrasting pieces from two musical eras". In competitions or auditions, flute students may also have to "Choose a Baroque/Classical piece, and then choose a Romantic or Modern piece". They then turn to the internet for help, and get lost in lists of repertoire and cross-referencing the dates, or get lost in a discussion of whether Beethoven is Romantic or Classical, only to find there's very few actual flute pieces by Beethoven. You can enter a tiny flutey coma after this kind of confusion. But fear not. I'm here to help. :>) hahhahahaa! Here is a useful chart from an old book from the 1950s. 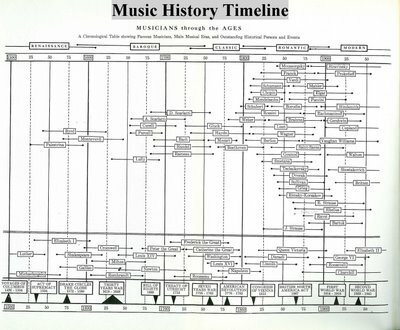 (Almost)Everything you want to know about which musical era your piece or composer comes from. Isn't this a great little chart? You can download a PDF version here too. Download it and print it, then, as you gradually learn your flute pieces and look up their composer's dates you can add those composers to this chart (in tiny black ink as I do! :>) or make a new one up based on this template. 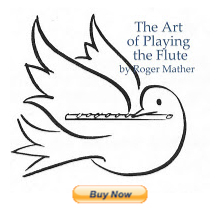 And more about choosing flute repertoire in the next post. Wow! I cannot tell you how many times I could have used this. This is an excellent resource that I really look forward to using. You’re description of the situation that arises when a flutist is looking for rep. describes my experiences to a T! It’s somewhat embarrassing but I have frequently been overwhelmed by all of this information. Thanks a lot! 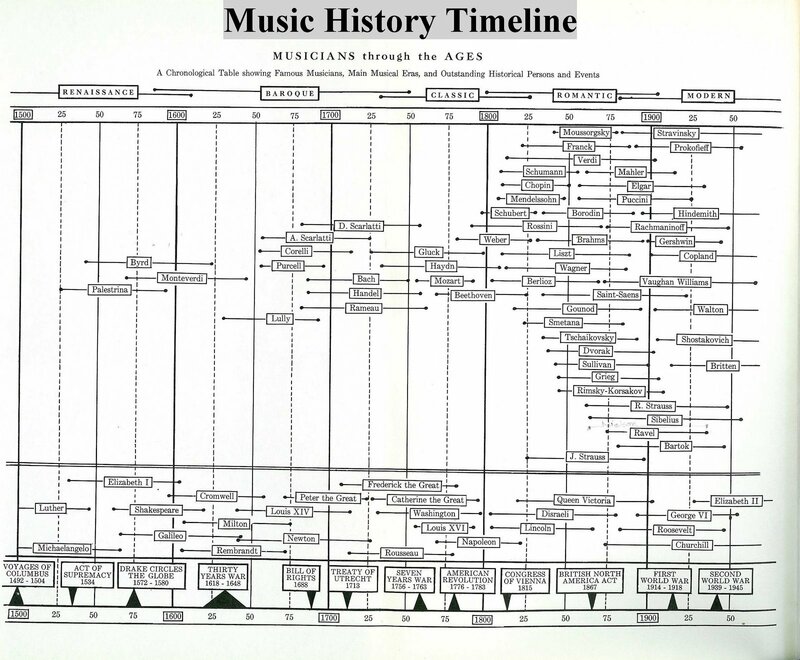 I can't believe that no one has printed a chart like this that I've ever seen EXCEPT this old music text book. Good grief. To think of all the date memorizing that would be eliminated if you could just have the chart at a glance. Now to fill it in and update it with more composers! Very nice chart. From what book is it? It is a 1961 book called "For Young Musicians - Vol. 1 - a handbook", by Kenneth I. Bray and D. Bruce Snell. Published by Waterloo Music Company.